As I’m typing this first line out on my newest post (yes, the one you’re reading right now), I have yet to work on my art project that I begun a couple days ago. Rather than do any of that today, I’ve instead redesigned a few bits on my website, got completely set up on this thing called Pinterest (I still have yet to fully grasp that whole Instagram thing! ), and I begun selling my artwork on a website called Artpal. Not to mention changed a couple ideas on what I want to focus on going forward from this point onward. 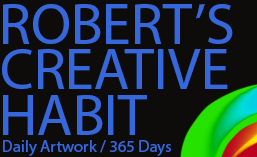 Turns out day 188 of my creative habit is going to be an important one, as far as the future of my art career is concerned. Okay, so today will likely turn out to be an insignificant day down the road. I just thought that opening sounded dramatic. Seriously though, who really knows? Today I was inspired to make a whole bunch of changes, and boy were changes made! Whether it’s truly a big change or not, only time will tell. So, first off, I’m not sure if I’ll do any drawing today. No, this isn’t the beginning of my downfall! Because everything will indeed go back to normal tomorrow. Today though, I’ve spent the past 6 hours working really hard, and doing plenty of different types of creative work. So I’m saying that totally counts as continuing my creative habit. For starters, I fiddled with some Photoshop images by re-sizing them. I wanted a better fitting header image for this website, and after working through a few issues, I think it looks much better. What? You didn’t even notice? Yeah. It was more of an obsessive compulsive thing I wanted to work on. I doubt anyone else will really notice a change. Just trust me, it’s a bit better. I got a decent photo in proper daylight of my last completed drawing. 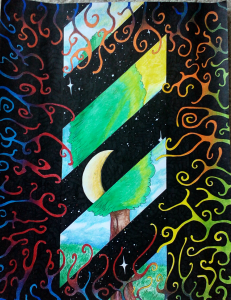 The one with the colorful tendrils and the night sky/daytime tree, and I’ve been meaning to put up a better quality version of it for a couple of days now. Today I was able to do that, and I’m really proud of how it turned out. I wish everyone could see the drawings I see when I look at them on paper, rather than the lower quality photographed digital versions that I put up. Oftentimes they just don’t look very good. Someday, I really need to find a way to get an awesome digital camera. Or perhaps get them all scanned professionally. I started a Pinterest account today, as some of you may already know if you follow me on Facebook. I’m still unfamiliar with all of it’s features, but it seems that it’s a great way to post artwork from not only myself, but from artists that inspire me. I have a few “boards” so far already, and I think I’m already getting the hang of it. Not that it’s super difficult to figure out, as I think social media is made pretty user-friendly these days. Then there’s this Artpal thing. I was watching some inspiring and educational videos from The Abundant Artist Youtube page last night, and they mentioned Artpal a few times as a place to buy and sell artwork prints. It wasn’t mentioned as a promotional thing (they were quite clear that they weren’t sponsored), it was mentioned because it’s apparently a good site to use to sell your artwork. I’m all signed up and I’ve uploaded a bunch of my artwork. However, right now I’ve only fully fleshed out a couple pieces so there should only be a couple officially available to buy at the moment. The number of pieces for sale should go up by the end of the night. Artpal sells different types of prints, like stretched canvas and even originals. For originals though, you would have to prepare and mail them yourself, and I’m not at that point just yet. So I opted for them to print for me, and they even provide options to purchase the art already framed! I’m pretty impressed with all the features they have, even though I’ve only been working on my gallery for Artpal for a couple hours at most. Lastly, I was also watching some other art related Youtube videos from various artists and, because of their advice, decided that I need to find a focus. I’m definitely using that as a key word here; focus. I was kind of casually planning on figuring out what I was going to do in the future after my year of creative habits is complete. Instead, I think it’s best to jump into it right away. There really isn’t a good reason why I needed to wait until my 365 days were over, save for the fear of actually making important decisions. So, as of right now, my focus is going to be creating worlds, galaxies, and an entire universe. For those that are talking to me on a daily basis, or really following my work, this should be familiar as I’ve talked about it a lot recently. I want to build a consistent universe. Now, this won’t really change how I create, or even to a certain extent, what I create. It will however keep everything consistently linked together. If I design characters, or abstract pieces, or paint pictures of space, for example, they will all be tied together in the same universe. Casual viewers of my future work might not even notice much of a difference with what I draw, but it’s more about how I approach my drawing or digital painting. In my mind, I’ll need to figure out how what I’m about to draw fits in together with this new universe. I really enjoy the simple idea of building a mythology around a single universe, so I’m keeping my focus, and moving forward with all of this in mind. I know, I keep using the word “universe” repeatedly, but that’s how I’m getting this started. I need that idea to stick with me. Universe. Universe. Universe. A universe is big, and I can fit just about anything inside of it. This could be abstract designs that might go on clothing, or alien wildlife/plantlife, pictures of space, or paintings of technology… The list really does go on and on, and still doesn’t effect a lot of what I’ve been creating anyways. I’m not sure if there will be a vast change in exactly what I produce artistically from here on out, certainly not in the short term, but my artwork needs more focus, and this feels like something I can, and should, try to accomplish to continue moving forward as a successful artist.